While choosing a hosting option for your project, it’s important to pick the right one. Today, hosting involves several options – Shared, Reseller, VPS, Dedicated, Cloud, Hybrid, Cloud VPS, WordPress and so on. You might be aware of all these hosting servers, except hybrid server. There’s a big confusion when talking about a hybrid server and yes one actually jumbles it with a dedicated the server. 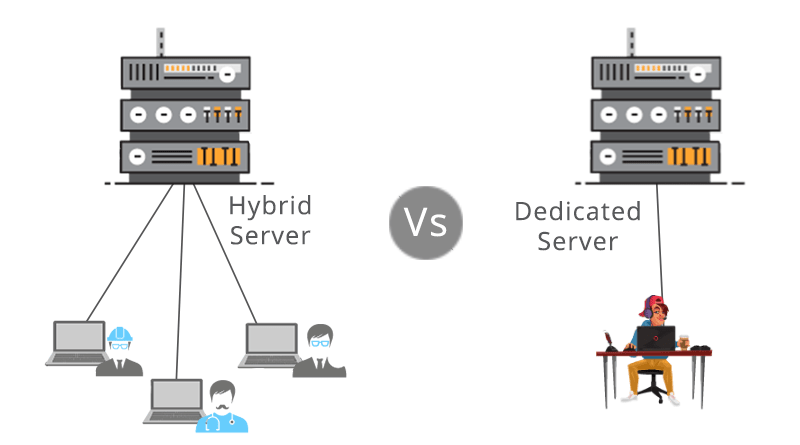 What is a Hybrid Server? A hybrid server can be termed as large, powerful dedicated server that is partitioned into larger chunks with the use of virtualization technology. Each physical server comprises a small number of hybrid servers, wherein each hybrid server has more guaranteed resources in comparison to a typical virtual server. A hybrid server can be utilized for any project as testing and development servers, backend servers for mobile applications, web hosting server and so on. Actually, a hybrid server is based on the concept similar to a VPS but is split into larger chunks that deliver the performance of a dedicated server at a lower price. Is your website generating high-traffic? Hybrid servers are the best for you. Additionally, they are also beneficial to content management systems, databases, eCommerce applications and file storage. When any hosting scenario requires a more flexible environment in terms of virtualization (development, testing and staging servers, load balanced clusters, continuous integration servers and other applications) where one needs an easy deployment of new servers quickly and reboot or reinstall OS on the server at times, then a hybrid server is highly beneficial. A hybrid dedicated server is allocated to a limited number of users, unlike other traditional hosting options that are ‘shared’ by several users. You get complete access privileges to your hybrid server similar to a dedicated server. The server performance isn’t affected by other websites or users since you get dedicated resources. You can easily scale your resources as per requirement unlike the dedicated server wherein the server has to be taken offline to perform the upgrade process. Additionally, the full administrator access control gives you complete control of all the software applications that are installed along with the operating system. A dedicated server is a type of remote server that is completely dedicated to a single user, organization or application. Who can opt for a dedicated server? Since the dedicated server is used by a single user or for one intention, one gets complete access to the server. You aren’t sharing resources with anyone, so, all the resources are yours. With a dedicated server, you get a greater level of security, since the hardware and software firewalls are in place as well as virus and malware scans are done to prevent data breaches and hacks. If you are looking for the flexible environment on your server, you have chosen the right one. A dedicated server is managed only by you and hence, the restriction on what goes on the server and what doesn’t gets eliminated. Unlike the shared server, you don’t get limited resources on the server as you can add-in resources by paying a certain cost. There isn’t any tension about website functioning as you get high performance and stability. Which One to Choose – Hybrid or Dedicated? Looking at the features of both hybrid and dedicated server, you might have noticed that there’s no big difference between the two. But, yes with a hybrid server you get a scalability option at low cost than the dedicated server. So, it’s better to go for a hybrid server if you are running out of the budget. Indeed, informative and technical article! Thanks for sharing. To get complete access to the server, dedicated server is beneficial. Another major advantage of a dedicated server is that you can’t share the resources with anyone. The key points of dedicated servers are really helpful for the users whose website generates heavy traffic. Thanks for providing useful information.